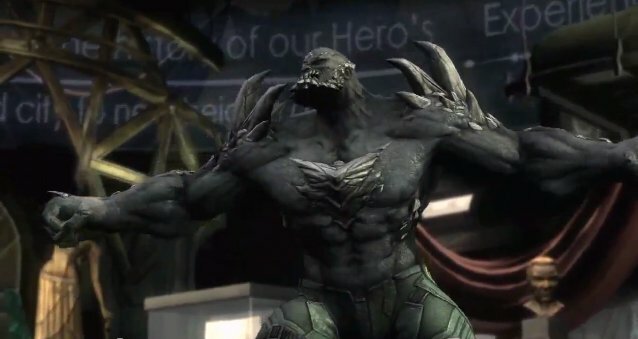 Monstrous Kryptonian villain Doomsday has been confirmed to appear as a playable character in NetherRealm Studios’ upcoming fighter Injustice: Gods Among Us, which features heroes and villains from the DC universe beating the snot out of each other. The character was revealed to be playable in a trailer released by NetherRealm, which features the hulking beast going toe-to-toe with Shazam and wrecking the scenery. The video can be viewed below. Doomsday is perhaps best known as the character who “killed” Superman in the blockbuster 1992 comic book storyline “The Death of Superman” (in true comic book form, Supes got better). The creature is the remnant of an ancient Kryptonian race with a seething hatred for any and all living beings. Since his initial appearance the character has occasionally popped up to terrorize the Last Son of Krypton, although he’s never reached the same high profile he saw when he offed Big Blue. Injustice is set in a dystopian, alternate version of the DC universe. After Superman’s home city of Metropolis is destroyed at the hands of the Joker – in which Superman’s wife Lois Lane, his unborn child and best friend Jimmy Olsen are also killed – the normally even-keeled superhero establishes a new world order in which some heroes rule the world with an iron fist. This puts another group of heroes – led, of course, by Batman – at odds with Supes, and next thing you know, you’ve got a superhero civil war on your hands (think Kingdom Come with less Alex Ross and more combos). The game is set to launch April 16 for Xbox 360, PlayStation 3 and Wii U. Are you excited to beat on your favorite childhood heroes in Injustice? Does Doomsday’s inclusion mean anything to you? Has the spectre of Mortal Kombat vs. DC Universe dampened your enthusiasm for the game? Let us know in the comments.